DR 900 Colorimeter, two 1-inch glass sample cells marked at 10, 20 and 25 mL, two 1 cm plastic sample cells, 1 x 16-mm COD/Test 'N Tube™ adapter, 4 AA alkaline batteries, printed multilingual instrument manual, instrument and procedure manuals on CD, USB Mini to USB Cable, European CE mark. Save time by storing your most standard methods for quick access in less than 4 clicks. This hand-held, rugged colorimeter is waterproof and dustproof. Drop tested and shock resistant for greater quality assurance. Improved user interface allows quick selections and easier testing. Stores data for up to 500 tests, and comes with a USB port for easily downloading or transferring information. 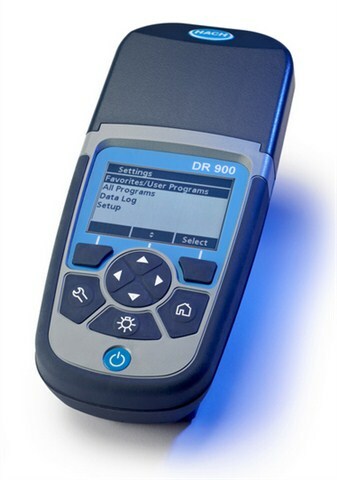 A single hand-held instrument provides access to 90 of the most common parameters. There are no threads in Hach Company DR 900 Reviews at this time.